Welcome to the Home Page of the Pack 651 Bear Den. Den Leader Shaye McCullough welcomes you! In this section, you will read about the requirements to become a Bear. If these activities sound like something you would be interested in, contact us via the "Contact out Pack" link above and we would be glad to get you in touch with our leaders. The new club year will begin with a pack meeting in August. Hope to see you there! in the 2015 edition of the Bear Handbook (33451). 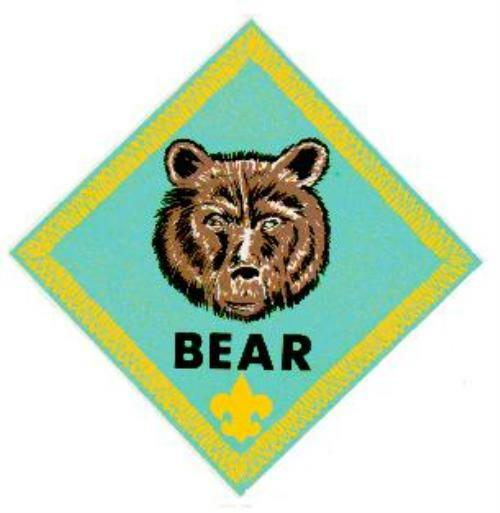 To earn the Bear Badge, a Cub Scout must complete the required Bear adventures below. The achievements are grouped in 6 major areas, or Adventures. Within each Adventure, a required number of tasks must be completed, as indicated below. **Note that these activities may be done at home and signed off by the parent after the boy has completed each task. The book is then shown to the Den Leader who records the progress and also signs the scout's book.